We’ve got hold of the great video for ‘Hold On’ by Foreign Beggars, featuring Skinnyman. Come inside and ch-check it out! In 2003 Dented Records released one of the more celebrated UK hiphop albums, ‘Asylum Speakers’ by Foreign Beggars. The album was extremely solid, including guest features by Tommy Evans, Dr. Syntax, Taskforce, Wayne Wonda and many more. One of the most entertaining collaborations was ‘Hold On’ which featured Mud Fam’s Skinnyman. The up-tempo track soon became a scene favourite. Whilst we wait for the release of the fantastic ‘Let It Go’ featuring Wildchild, from the forthcoming second album, here’s the video for that classic tune. Patience is a virtue, and this video is well worth waiting to load. Enjoy! 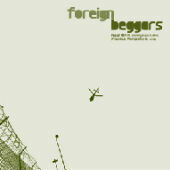 For more information on Foreign Beggars, check out www.dentedrecords.com where you can find out the gang’s latest tour dates and buy all of their releases.